This article describes how to install Avi Vantage in a Linux server cloud. Avi Vantage is a software-based solution that provides real-time analytics and elastic application delivery services, including user-to-application timing, SSL termination, and load balancing. Installing Avi Vantage directly onto Linux servers leverages the raw horsepower of the underlying hardware without the overhead added by a virtualization layer. Avi Networks recommends that users disable hyperthreading (HT) in the BIOS of the Linux servers upon which Avi runs prior to installing Avi Vantage on them. It doesn’t get changed often, but RHEL, OEL and CentOS may map physical and hyperthreaded cores differently. Rather than basing its decision on the behaviour or characteristics of a core, Avi Vantage has a predictive map of the host OS via which it skips or ignores hyperthreaded cores. When an OS gets upgraded, this map might change, which means we might be utilizing a HT core instead of a virtual core, which in turn will impact performance. The Avi Vantage Linux server cloud solution uses containerization provided by Docker for support across operating systems and for easy installation. 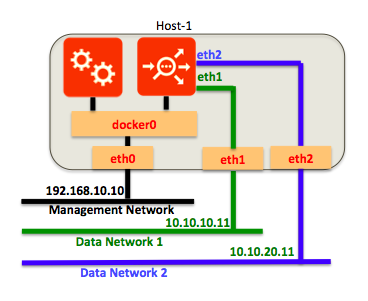 Avi Vantage can be deployed onto a Linux server cloud in the following topologies. The minimum number of Linux servers required for deployment depends on the deployment topology. A three-Controller cluster is strongly recommended for production environments. Single host 1 Avi Controller and Avi SE both run on a single host. Separate hosts 2 Avi Controller and Avi SE run on separate hosts. The Avi Controller is deployed on one of the hosts. The Avi SE is deployed on the other host. 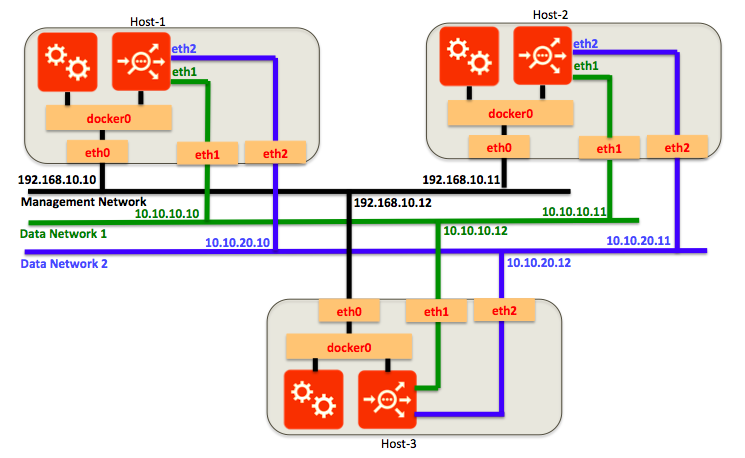 3-host cluster 3 Provides high availability for the Avi Controller. A single instance of the Avi Controller is deployed on each host. At any given time, one of the Avi Controllers is the leader and the other 2 are followers. Single-host deployment runs the Avi Controller and Avi SE on the same Linux server. This is the simplest topology to deploy. However, this topology does not provide high availability for either the Avi Controller or Avi SE. Note: In single-host mode, in-band management is not supported. Two-host deployment runs the Avi Controller on one Linux server and the Avi SE on another Linux server. Three-host deployment requires a separate instance of the Avi Controller on each of 3 Linux servers. In a 3-host cluster deployment, one of the Avi Controller instances is the leader. The other 2 instances are followers. If the leader goes down, one of the followers takes over so that control-plane functionality for users is continued. This section lists the minimum requirements for installation. Docker local storage (default /var/lib/docker) should be at least 18 GB to run Avi containers. If the Avi SE is instantiated through the cloud UI, add 5 GB to run the Avi SE. By default, the Docker devicemapper storage driver is configured in loop-lvm storage mode, which is only recommended for testing. Avi recommends configuration of the driver according to Docker best practices for Controller hosts which will be used for production. Refer to Docker storage drivers for recommendations on choosing a storage driver. Network Interface Controller (NIC) For Intel NICs, refer to this section of the Ecosystem Support article. Note: You can place the Avi Controller and Service Engine containers on the same host starting only from RHEL version 7.4. If co-located on the same host, restarting either container will fail for RHEL versions prior to 7.4. Default port assignments are as shown below. If these are in use, chose alternative ports for the purposes listed. Install the NTP server on the host OS. Install the Avi Controller image onto a Linux server. The SSH, Avi SE host, and multitenancy selections can be configured either using the wizard or later, after completing it. (The wizard times out after a while.) This article provides links for configuring these objects using the Avi Controller web interface. Run the setup.py script. It can be run in interactive mode or as a single command string. If entered as a command string, the script sets the options that are included in the command string to the specified values, and leaves the other values set to their defaults. Go to Step 6. In interactive mode, the script displays a prompt for configuring each option. Go to Step 7. Note: To ensure proper operation of the avi_baremetal_setup.py script in either steps 6 or 7, the locale must be set to English. Use the LANG=en_US.UTF-8 command. 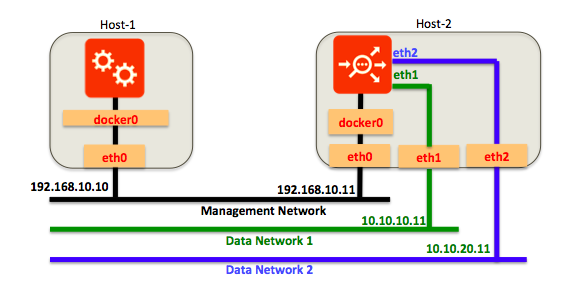 If deploying a 3-host cluster, repeat the steps above on the hosts for each of the other 2 Controllers. Note: Following reboot, it takes about 3 to 5 minutes before the web interface becomes available. Until the reboot is complete, web interface access will appear to be frozen. This is normal. Starting with Avi Vantage release 16.3, reboot is not required. To continue with the initial setup wizard and to add Avi Service Engine hosts to the Linux server cloud, read Configuring Avi Vantage for Application Delivery in Linux Server Cloud.